This Hampta Pass trek takes you on a 6-day adventure in the mountains of Himachal Pradesh with stunning views of Mt. Indrasan, the highest peak in the Kullu valley. As you trek to an altitude of over 14,000 feet in the Pir Panjal range, you'll make your way trek past roaring waterfalls and river streams, get distant views of peaks in the Spiti Valley, camp in alpine tents under the starlit sky and wake up to misty mornings deep in nature! Another highlight of this trek, you'll travel to visit the crescent-shaped Chandratal Lake, a pleasant high-altitude lake with beautiful reflections of surrounding mountains. With a relatively easy trail through forests of oak, maple and pine, this Hampta Pass trek is perfect for all types of trekkers, seasoned and amateur. So, don’t think twice, book your spot, pack your bag and here you are. 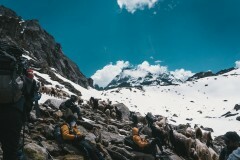 Perched in the midst of the Pir Panjal mountain range, Hampta Pass connects the two valleys of Lahaul and Spiti in Himachal Pradesh. Decades ago, the trail going through the Hampta Pass served as an important route for traders in the valley. 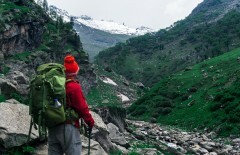 On this Hampta Pass trek, as you trek deeper and deeper in the Kullu valley, you'll witness a changing landscape, from the lush, green hillside to the barren, arid terrain. Often, the Hampta Pass is layered by vast patches of snow, offering panoramic views of a pristine white landscape. 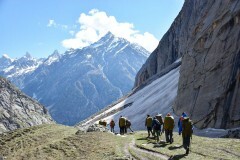 • Explore the scenic route of the Hampta Pass trek. 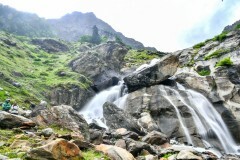 • Get astounding views of the Pir Panjal mountain range. • Trek through dense jungles, green meadows and snowy patches. • Camp in tents pitched at some of the most picturesque locations. 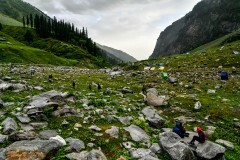 For cancellations made more than 20 days before departure date of the Hampta Pass trek: 80% refund. 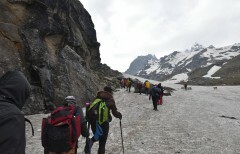 For cancellations made 20 days or less before departure date of the Hampta Pass trek: no refund. Report to the base camp at Rumsu by 08:00 hrs. Upon arrival, you'll rest at the base camp, complete the paperwork and embark on an acclimatization walk. Explore the base camp, visit the Rumsu village and return to the campsite. In the afternoon, you'll have an orientation to prepare for your upcoming trek. Overnight in tents at Rumsu. 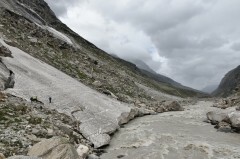 The trek begins as you board a vehicle for a short drive from the base camp to the Hampta Dam. From here, you'll continue on foot, hiking over a short and simple trail through the woods. You'll cross a few wooden bridges over river streams and trek across a gorgeous waterfall. Spend the afternoon at leisure after arriving at Chikha. Overnight in tents at Chikha. Cross river streams and trek past waterfalls. Depart for Balu ka Ghera. During the initial stretch of today's trek, you'll hike through a river bank with large boulders all around you. En route, you'll stop at vantage points with exquisite views of Mt. 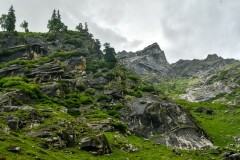 Indrasan, the highest peak in the Manali valley. Crossing a river stream, you'll soon reach the large meadow of Balu ka Ghera. Enjoy the evening at peace with sunset views. Overnight in tents at Balu ka Ghera. Click amazing, close-up photos of snow-capped peaks. Begin early in the day to embark on the longest trek of your journey. 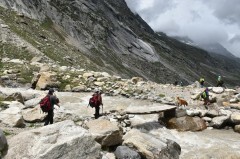 Today, you'll climb a moderately difficult trail, with frequently steep inclines, to reach the Hampta Pass. From here, you can get aerial views of the surrounding landscape, including the peaks of Himachal's Spiti Valley on the horizon. Crossing the Hampta Pass, you'll descend down to Shia Ghoru on the other side of the pass. Overnight in tents at Shia Ghoru. 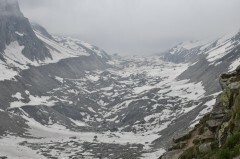 Climb through patches of thick snow in the Kullu valley. After an early morning wake up call, you'll continue descending until you arrive at Chhatru. 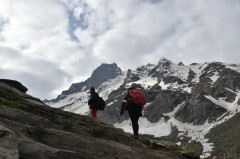 Stunning views of mountains in the Pir Panjal range accompany you throughout the day's trek. After a short rest stop at Chhatru, you'll board a vehicle and travel to the Chandratal Lake. A high-altitude, crescent-shaped lake, the Chandratal Lake is open for visitors only in the summer. You'll return to Chhatru by late evening. Overnight in tents at Chhatru. Spend a few moments in peace by the Chandratal Lake. Spend the morning at leisure. 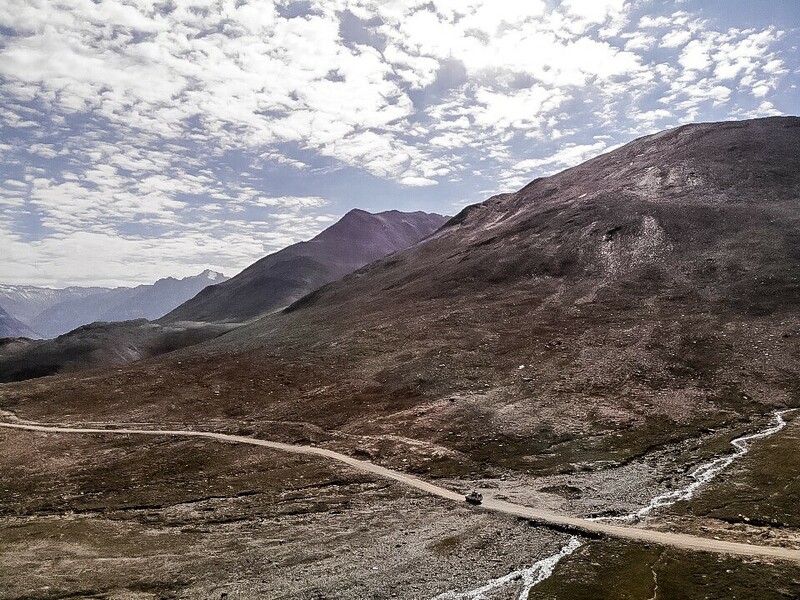 Today, you'll board a vehicle once again and drive back to the Rumsu base camp, via the famed Rohtang Pass. 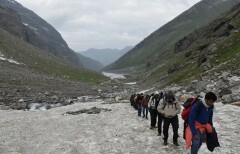 En route, you'll pass through the hill station of Manali. You'll reach the Rumsu base camp by 16:00 hrs. Your trip ends here. Travel across some of the most stunning landscapes. Report to the Rumsu base camp. To reach Rumsu, you can also hire a public taxi from the Patlikuhal bus stop at an additional cost of INR 500-700 for 6-7 travellers. You'll be accommodated in tents at the Rumsu base camp. Today's meal package includes breakfast, lunch and dinner. 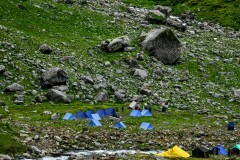 Overnight in tents at Chikha. Drive from Rumsu to the Hampta Dam and trek from the Hampta Dam to Chikha. 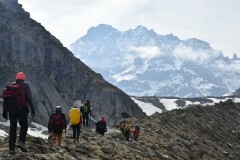 Throughout the trek, you'll be accompanied by an experienced trek leader and a support staff of cooks, helpers and porters. You'll be accommodated in tents at Chikha. Today's meal package includes breakfast, lunch and dinner. Overnight in tents at Balu ka Ghera. 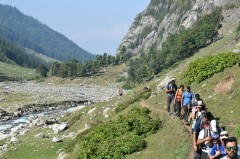 Trek from Chikha to Balu ka Ghera. You'll be accommodated in tents at Balu ka Ghera. You'll also be issued high-quality sleeping bags for overnight stay in tents. These sleeping bags can withstand temperatures of -10 degrees Celsius. Today's meal package includes breakfast, lunch and dinner. Overnight in tents at Shia Ghoru. 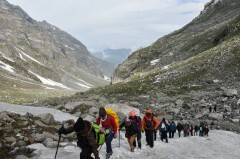 Trek from Balu ka Ghera to Shia Ghoru. You'll be accommodated in tents at Shia Ghoru. Today's meal package includes breakfast, lunch and dinner. All meals will include vegetarian and Jain food. Overnight in tents at Chhatru. Trek from Shia Ghoru to Chhatru and visit Chandratal Lake. You'll be accommodated in tents at Chhatru. Today's meal package includes breakfast, lunch and dinner. Travellers are required to carry their own lunch box and water bottle with them. 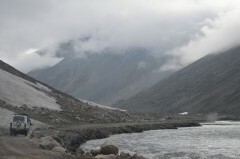 Drive from Chhatru to Rumsu base camp. Today's meal package includes breakfast only. Your trip ends here. Rumsu, accessible via road, is located 40-km/2-hr drive away from the Bhuntar Airport in Kullu. You can board a flight to the airport and hire a private cab or taxi to travel to the Rumsu base camp. 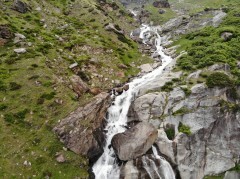 Your tour operator will arrange your transport to the start point of this Hampta Pass trek.